"Murderfloof the Big Bad Wolf" is my new headcanon. many childrens shows are quite bloodthirsty in hindsight….never mind the original grimms fairytales. blood and guts in every corner! And let’s not forget certain Disney films… I still remember the moment in grade 2 when I realized that all of the death and destruction in Hunchback of Notre Dame was happening solely because some old [expletive] wanted the gypsy for his bed, and how absolutely ‘messed the craps up’ that whole movie was. Let’s not forget other child friendly Disney movies like The Lion King, where Simba got to see his father get betrayed by his uncle, thrown off a cliff, and then trampled to death by wildebeests. Simba was a kid at that time. That was a kids movie. I was 8. It’s all in how you play it. There are versions of Phantom of the Opera that are horror films, and other versions that are love stories. The thing that Operas, and Circuses, and Theatres around the world have totally in common is: The Show Must Go On. Even if the lion-tamer loses an arm, if the clown is trampled by an Heffalump, if a Trapeeze artiste breaks a neck; distract the crowd, clean up the mess, clowns, make ’em laugh, next act you’re up! The show must go on. To be fair, The Show Must Go On is mostly a circus thing that got, uh, “borrowed” by other aspects of show business. Your examples were spot on, but the idea is; if something terrible is happening, get Something bright and fascinating so the audience doesn’t panic and start trampling each other trying to get out! 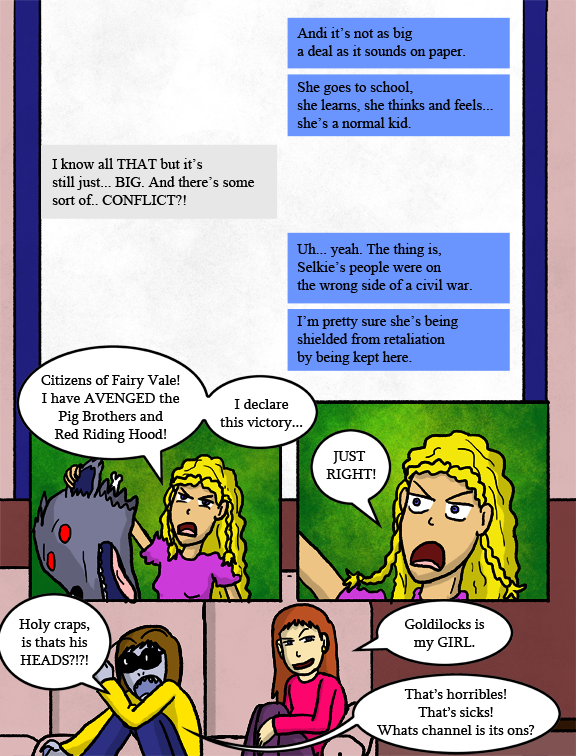 So what victories does Goldilocks declare too hot or too cold? Well “too hot” would probably be an atomic bomb. And “too cold” would probably be a nuclear winter brought about by the detonation of many, many of said atomic bombs. Nah, too cold should be the opposite of too hot. So it’d be cold war, with no direct conflict between Goldilocks and the wolf, but each controlling what they can and demonizing the other until victory is eventually achieved by the wolf not getting enough food and dying. I may have put way too much thought into this. Hey! No non-suiters in the headless lounge! It’s o.k., I’m training her to be support/guide person. And it’s NOT a Wookie, it’s s Sheltie!!! This show probably would be beloved by children the world over. No worse that I’ve seen Teen Titans Go! have done. You know, it’s times like these that I can see those two all grown up and having each other’s back against the world. Well, she DID immediately ask what channel it’s on. Seems like Andi isn’t necessarily worried that Selkie is dangerous, she’s just coming to terms with intelligent humanoids walking among them and the giant laser beam. A fair thing to have trouble gripping. The whole war thing isn’t going to make that any better. Todd is super bad at this. And this is why the government is doing what they’re doing. The only thing stopping Andi from having a complete freakout is that the fact that she already knows Selkie as a person before finding out she’s not a human. She really didn’t need to know about the potential species war that may or may not happen, especially since Todd worded it in a way that puts the *entire species* at fault instead of *individual people in said species* like every other war instigated by anyone ever. In a way, that’s what the whole “slow integration” thing is, that the Govment’s doing. 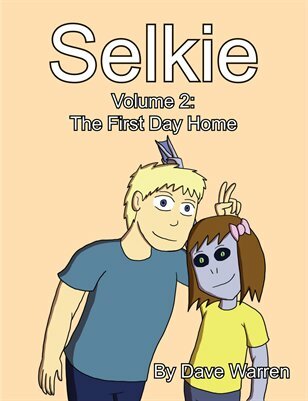 What with Dr. Pohl and his family, Selkie, probably other Sarnothi scattered around the country or even maybe the world… Get people used to occasionally seeing people with ‘that condition’, maybe have them as their dentists or schoolteachers or neighbors or the couple that runs the foreign foods market, and as it eventually starts coming out that they’re a separate species, you have less of an angry mob, and more of a slow wave of confusion and acceptance centered in those areas. Seems like something of a gamble, as you can then get an angry mob due to people being angry that the government lied to them instead. I believe they call it misinformation,… Or is it disinformation? Now I’ve forgotten. It’s been a long time since Nixon. …or Reagan, or Carter, or Clinton, or Bush Sr., Bush Jr., oh, wait, they all do it. I’d say Disney but I don’t think this is weird enough for them. Dark enough sure but not weird. I kind of want this show to exist. Ignoring Selkie’s last line, I think it’s amusing that she’s the one who’s shocked by the beheading, while Amanda treats it as business as usual — immediately after a scene where the concern is over what to make of Selkie’s people. That’s a good parallel to Todd and Andi’s situation right now, with Amanda acting like Todd and Selkie acting like Andi. Sounds kinda like an It’s Always Sunny reference, actually. So… who else wants Goldilocks to get her own spin off comic like Sue and Katherine? She already does. 56shards.com :)! Thanks for the plug Dave!